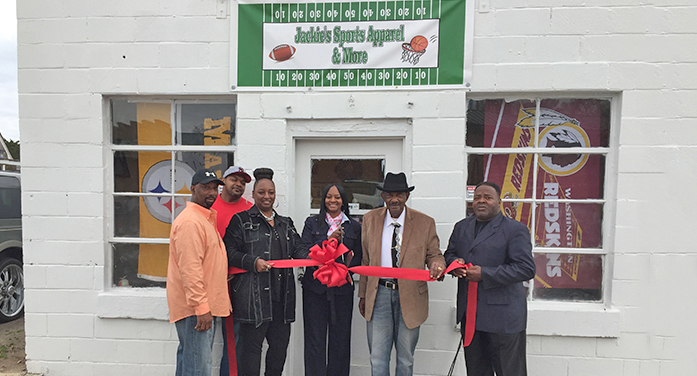 The Edgefield County Chamber of Commerce held a ribbon cutting on Saturday, December 3 at Jackie’s Sports Apparel & More located at 608 Railroad Avenue in Johnston, SC. Jacqueline Cummings and her family welcome this new business to Edgefield County, just in time for the Christmas season. Her store carries sports apparel for the whole family. From jerseys, jackets, caps, socks, car flags, team bag holders to hand painted glasses (with drink recipes on the bottom), homemade wreaths, etc.. You name it in sports apparel and they can get it. Jackie does embroidery, too! !